Undebt.it is a free site that I have created (and maintain) in my free time. It is just a tool that I use personally that I felt that others might benefit from as well. If you do find it useful, there are several different ways that you can support the site and keep it free. Undebt.it+ membership gives you access to premium, power user functions that aren't available on the free site. The membership is a low, yearly fee that helps offset the costs involved in developing and running the site. A free, no obligation 30-day trial is available. See the Undebt.it+ page for more information. 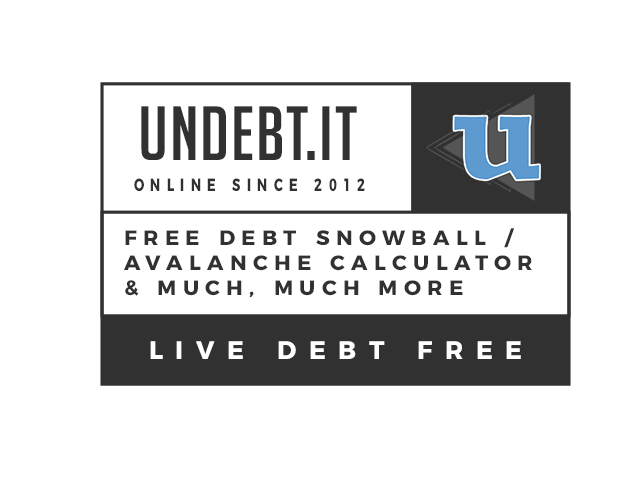 If you try Undebt.it and you like it, please share it with your friends. Any social media mentions help get the word out about how getting debt free can change your life. I'd especially love it if you would let me know when you're able to reach your debt free goal using Undebt.it - maybe an #undebt mention on Twitter or a pin on Pinterest. You can make a donation in any amount using Paypal. You don't even need to have a Paypal account to give a donation. Just click the link below to safely and securely send a donation. There are some small ads at the bottom of the page. Click on the links and see what they have to offer. If you use ad blocking software, please consider adding an exception for this site so the ads are displayed.